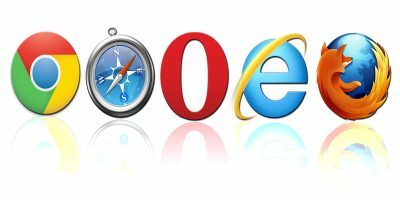 The browser is probably the second most used software in your computer, right after the operating system itself. 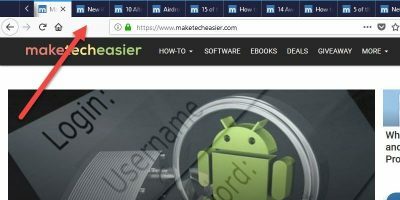 For the amount of time you spend on your browser, I am sure you will want to back up your browser data so you can easily restore your settings when the computer/browser crashes. 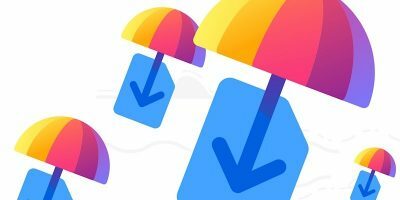 If you are a Firefox user and want to back up your browser data easily, check out FEBE (Firefox Environment Backup Extension). 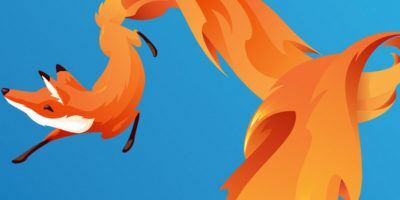 FEBE is a great utility that allows users to back up and restore Firefox data including extensions, themes, cookies, history and other browsing data. Long time Firefox users will be familiar with FEBE, because it has been around since the Firefox 2.x version. One of the positives is that its developer has been regularly updating it and adds new features with each update. The reason why I prefer FEBE over other backup utilities is that it creates separate .xpi files for your extensions so that you can easily restore them or save them online. It even allows users to schedule backups and upload it to Box (formerly Box.net). FEBE is really simple and easy to use. 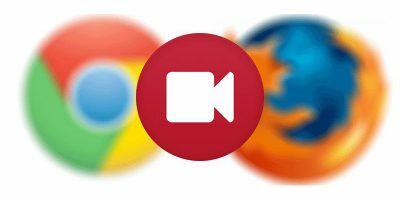 Go to Firefox Addons Repository and install FEBE. Once installed, the extension will add new options to the Firefox menu. From there, go to the “Where to Backup” tab and specify the directory location. You can even timestamp backups so you can easily check when the last one was done. 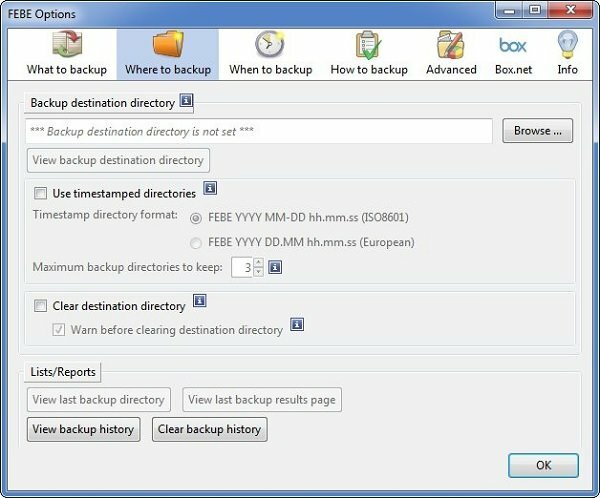 Even if you don’t timestamp your directories, you can use the backup history option to check for the date of backup. Now, click on the “What to Backup” tab and select the items you want to back up. If you want to create a full backup of your profile, simply check “Full Profile” under Backup Time and click OK. Otherwise, check the “Selective” option and select the items you want to back up. If you have an account on Box.net, you can sign in and save local Firefox backups online as well. You are almost done. Go to “Backup Utilities -> FEBE -> Perform Backup“. This will create a backup based on the backup options you configured earlier. After creating the backup, it will show you backup results that contains information about the backup and how much time it took to create the backup file. 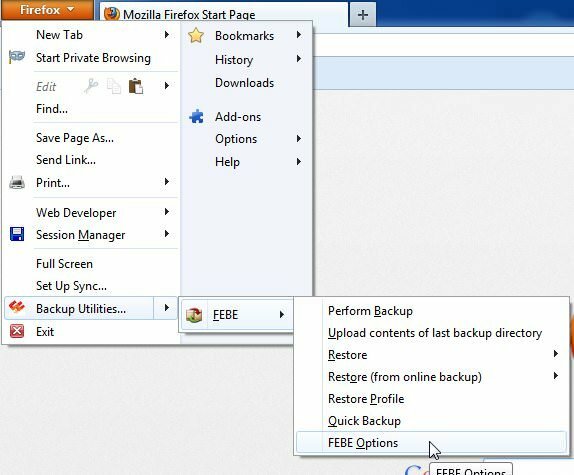 To restore the backup click on the Firefox button and go to “Backup Utilities -> FEBE -> Restore“. Select the items you want to restore. 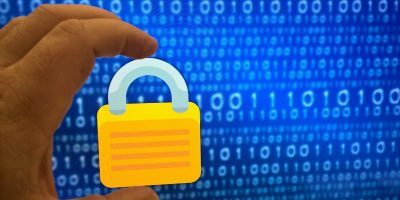 It will ask you to find the backup files from your computer or use your Box.net account to restore from the online backup. 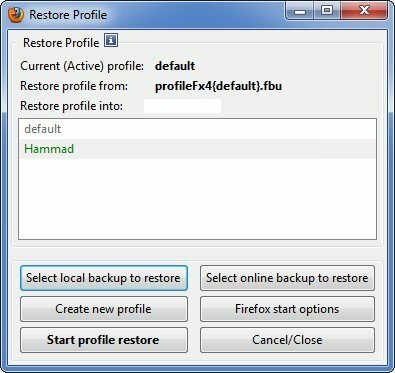 If you want to restore your complete profile, select “Restore Profile” instead and select the location of the file your computer or your Box account. it will also ask you to select the profile in which you want to restore the backup. Once done, click on the “Start Profile Restore” button and it will show you when that specific profile backup was created. Just click OK and you are done. 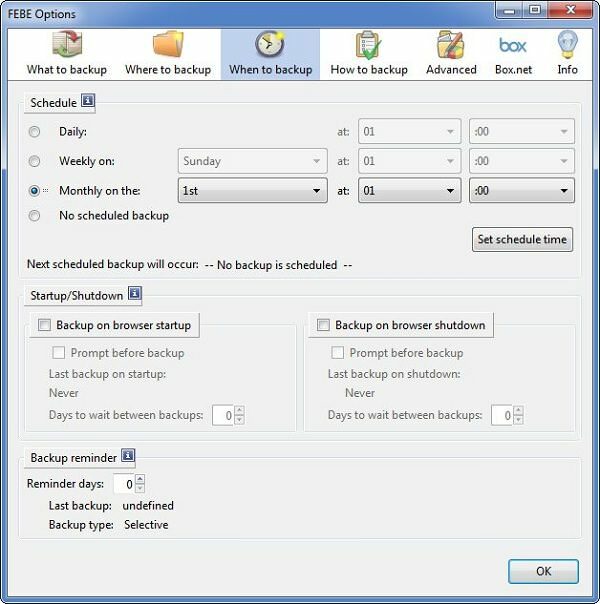 FEBE even allows users to schedule backups as well. 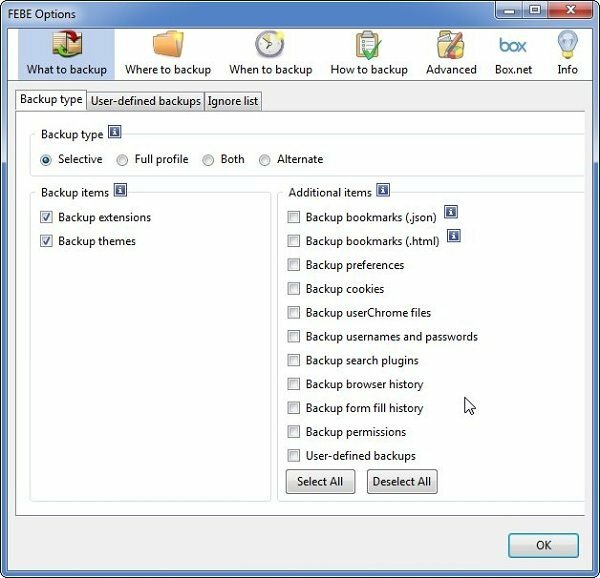 From FEBE Options, just go to the “When to Back Uup” tab and select the schedule and the time when you want FEBE to create a backup of your browsing data. If you want, you can even configure the extension to create a backup every time you start or close Firefox. 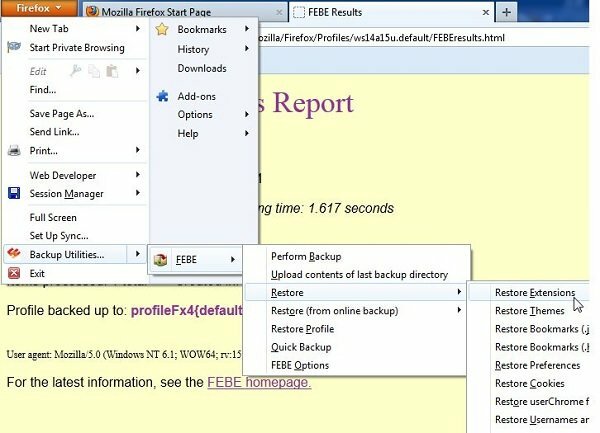 FEBE is a must have extension for all Firefox users who want to create timely backups of their profiles and other browsing data. It’s simple, user friendly and easy to use. And the best thing about this extension is that you can even schedule backups so that you don’t have to do that manually. If you tried FEBE, feel free to share your thoughts. I actually created a dedicated firefox folder and set my Firefox profile to point to that directory. 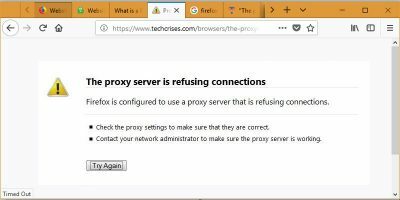 (run ‘firefox -P’ to manage Firefox profiles). I just save the entire folder to another location: should i reinstall my pc I would only need to copy the folder back. I forgot to mention you can run this program in background when your OS starts and made a different backup each day. This is very helpful in case your profile is infected with some malware, because you can to restore any previous backup (I made a new backup for monday, tuesday, wed… sunday, and next monday will replace the old Monday backup; this task is deployed automatically). Also you can choose what you want to backup, or protect your backup files with a password (highly recommended on Thunderbird environment with confidential emails!). I just check out MozBackup and it really looks good. Will try it out. Thanks for the recommendation, Benny.